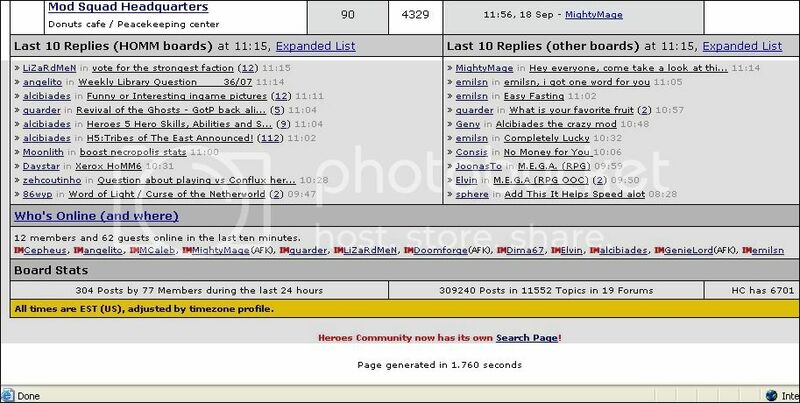 Edited by GenieLord at 12:20, 22 Aug 2008. Someone is online. You might be waiting for him to reply to a specific thread or to read the HCM you've just sent him, and maybe he's not even there? Maybe he just left one of the forum's pages open? I would like to suggest AFK (Away From Keyboard) mode. If we have this feature, we will be able to change our status from "Online" to "AFK". When we change pages, the status will be changed automaticly back to "Online". On the list of Who's online, in the bottom of the main page, if anyone is on AFK, next to his/her name will appear "(AFK)". Instead of the green circle next to everyone's name, when s/he is online, for people on AFK mode, there will be a blue circle. I am willing to pay 10 American Dollars for this feature. Please consider using it and tell me your decision. I have no problem that the use in my idea will be only partial. The choise of people is compeletly randomal. That is a very very good idea Genielord. Perhaps if that ever does happen, that could be on the HCM page as well. I spend some of my time HCM'ing certain people, and sometimes I send a message, and then they go off line. I would find this particularly useful. 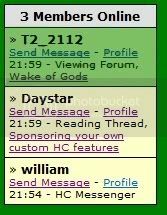 But I do not view the "Who's online" on the main HC page very often, I mainly watch the HCM "Who's Online". Like this in the messanger window? Edited by GenieLord at 17:56, 26 Oct 2007. I would prefer a different colour, maybe just a stronger yellow. ok, so the stonger yellow is AFK, but Valentin is writing a reply, so is he at his keyboard then? Oops, I didn't even notice. Well, you got the concept. Edited by Ted at 18:17, 26 Oct 2007. Edited by GenieLord at 18:44, 26 Oct 2007. I will sponser it, if Valeriy agress to have it in the forum. As I said, I'm willing to pay 10 dollars for it. You have nothing to be worried about, Valeriy sees everything. Perhaps if the user has not scrolled through any pages for the last 5 minutes, then the status automatically goes to AFK mode, and when you change pages again, then it goes back to Online mode. I thought about it, but there a problem with it: If the member is on his computer, with HC page open, but doing something else? He's not away from keyboard, and can look at the HC page on any moment. Therefore, I prefer that the member will choose when he appears to be online and when AFK. During the time, all important topics loose their rank so the new user can't find them. All important threads must be in top of every category. 1. Sticky threads - A thread that the moderators consider very important, might be stickied. 2. 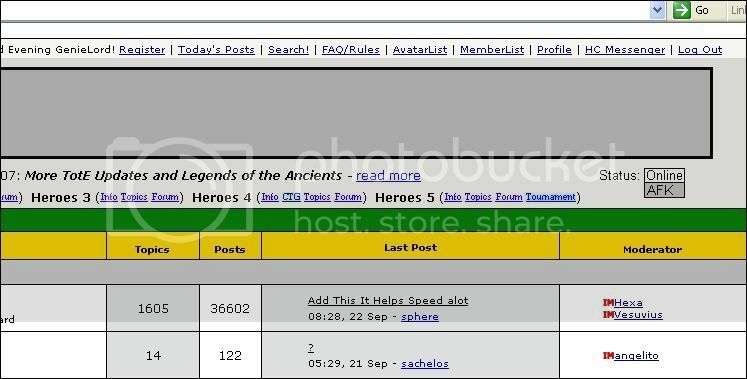 Tables Of Contents - All the threads of the forum can usually be found in the forum's Table of Contents. Edited by dmad at 23:11, 29 Dec 2007. If you want something stickied,you can ask,as I did when istarted my project. Edited by dmad at 23:36, 29 Dec 2007.
while posting it is good,i think would be prefferbull to HCM this to the modrator. Another (stupid) idea: it's possible to implement "Watch this topic" function? It's easy to receive e-mail notification if front of visiting that topic every hour, right? 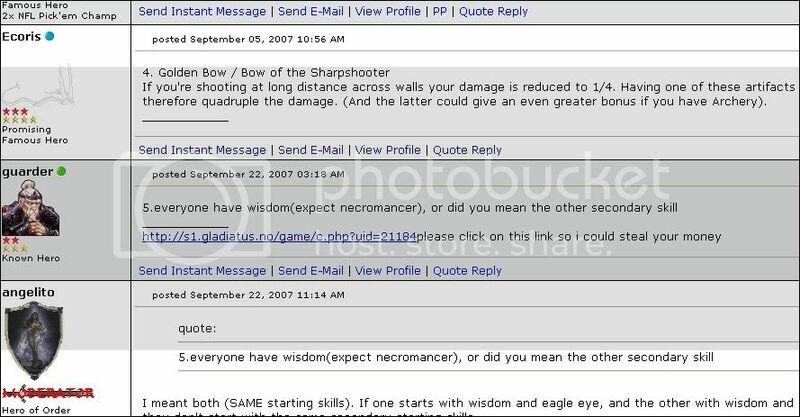 Edited by Gnoll_Mage at 23:07, 11 Jan 2008. What, have it such that you don't have to post in order to find out whether a thread is being replied to? Or am I misunderstanding you somewhere? Edited by dmad at 07:13, 12 Jan 2008.